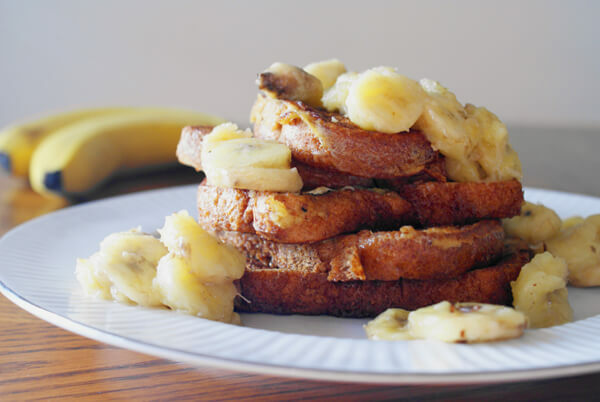 This French Toast with Sweet and Salty Buttered Bananas breakfast recipe is a perfectly sweet way to start your day! If I asked everyone I know, "Do you know how to make french toast?" I'm pretty sure every single person would say they do. It's a basic recipe that mom made for us and her mom made for her. You simply dip some bread in egg and throw it in the pan. This recipe, however, trumps any french toast I've ever tasted. I don't know if it's the subtle sweetness from the honey or the richness of the cream, but something about the combination of ingredients brings this classic to whole new levels of yumminess. I chose to use whole wheat bread in the dish pictured, but I've been known to substitute white bread, raisin bread, egg bread...pretty much any bread would work. Not a fan of bananas? Leave 'em off and go the traditional butter and syrup route. Either way, I'm sure this french toast will earn a permanent home in your recipe box. 1. Beat together eggs, whipping cream, honey, salt cinnamon and vanilla. 2. Melt 1 tbsp of butter in a large frying pan on medium heat. *It's important to cook these at a lower temperature than you might normally so that the sugar from the honey doesn't burn. 3. Dip both sides of bread in the egg mixture and place in frying pan. Cook until golden brown, adding the second tablespoon of butter to the pan when you flip the pieces of french toast. 4. While the french toast is cooking melt the butter for the bananas in a separate pan over medium heat. Add the bananas and salt and cook until the bananas are hot and begin to soften. Top the french toast with the bananas. Nutrition data should not be considered a guarantee. Please see our full Nutrition Data Disclosure for more information. This sounds delightful! I know what I'm making for breakfast tomorrow! This looks delicious! Just pinned! Thanks so much for linking up to Iron Chef Mom last week. Hope to see you back tonight! Thank you for the pin, Trish! Sorry I missed linking up again. I'll be back in the future though, for sure!